The family Crotaphytidae, or collared lizards, are 12 species in two genera of desert-dwelling reptiles native to the southwest USA and northern Mexico. They are very fast-moving animals, well known for the ability to run on their hind legs, with long limbs and tails, and are carnivorous, feeding mainly on smaller lizards. The name "collared lizard" comes from the lizards' distinct coloration, which includes bands of black around the neck and shoulders that look like a collar. Very active and predatory lizards requiring a large amount of space to run, they prefer high temperatures, up to 105 - 110F (40 - 43C) at their basking spot and 80F (26C) elsewhere in their habitat during the day. 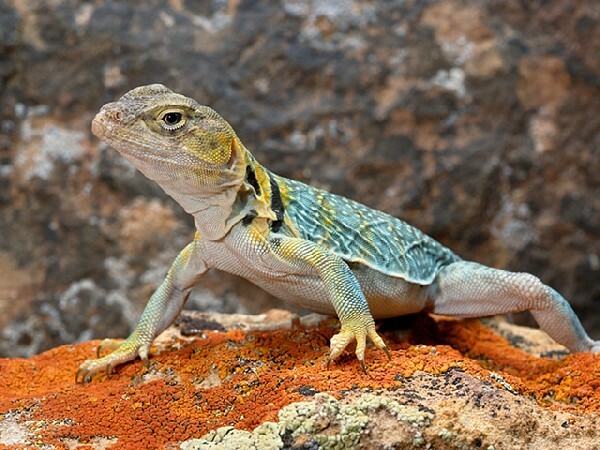 Here you may post messages or questions pertaining to all aspects and issues regarding the keeping, breeding, health, and conservation of Collared Lizards.